Russia’s closure of the NDN marks the end of an era. Last Friday, Russian Prime Minister Dmitri Medvedev signed a decree closing the Northern Distribution Network (NDN). NATO had used the NDN to deliver supplies to the war in Afghanistan since 2008. Although the route, according to the Moscow Times, hasn’t been used in recent months and the UN Security Council resolution under which Moscow agreed to allow NATO passage through its territory expired at the end of last year, the closure still takes on a geopolitical light. Moscow linked its choice to close the route to UNSC resolution 1386, which was the 2001 resolution that authorized the original ISAF mission in Afghanistan and encouraged regional states to allow transit and overflight. A subsequent resolution in 2013 set December 31, 2014 as resolution 1386’s expiration date. The NDN emerged as an alternate route for NATO to move supplies into and out of Afghanistan in 2008 in response to flaring tension on the Afghan-Pakistan border. 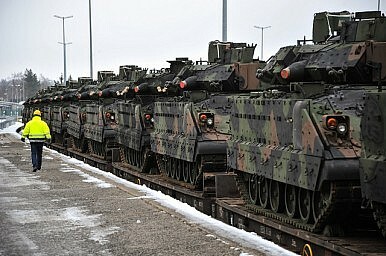 Pakistan every so often would shut the border to NATO traffic, generally in protest over drone strikes in its territory. With few options, NATO pressed for a northern transportation network through Central Asia. Far be it for me to suggest that Russian President Vladimir Putin hesitated, but he did not block the exit of NATO equipment from Afghanistan at the moment it would hurt the alliance the most. A number of developments since this time last year serve to mitigate the actual effects, though not the optics, of Russia’s move to close the NDN officially. For one thing, after the difficult and drawn out Afghan election last summer, a BSA was signed with little fanfare. At present, there are just over 13,000 foreign troops in Afghanistan as part of Resolute Support, the NATO follow-on mission. In March, U.S. President Barack Obama announced that the U.S. would maintain 9,800 troops in the country through a least the end of 2015. Also, whereas Karzai had an increasingly acrimonious relationship with Pakistan, the country’s new president has made strides in repairing the relationship between Afghanistan and Pakistan. The Af-Pak border isn’t likely to be closed again any time soon. In 2012 Pakistan and the U.S. signed an MOU to that effect, keeping the route open to NATO through 2015. The closure of the NDN certainly marks, as the Moscow Times says, “the end of an era in Russia’s relations with NATO and the United States.” It is, however, more of an optical jab than an actual punch that will have operational weight. The Pakistan route had always been cheaper, anyway. As the war moves into its 15th year, Afghanistan's stability remains tenuous.